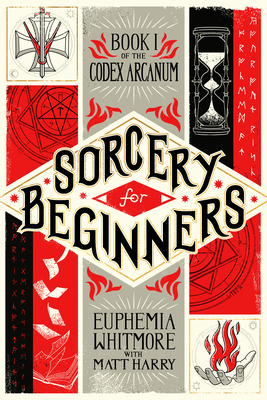 Matt Harry’s Sorcery for Beginners is a fun, fast, and furious story of teenagers discovering that magic is actually real. Fleeing from bullies, Owen Macready ducks into a strange bookstore called Codex Arcanum. Its proprietor insists he take a book of magical instruction called Sorcery for Beginners. Just like that, Owen and his pals become soldiers in a secret war against the terrible Euclideans, people who hate magic and wish to drive it from the world. The book impressively gets the life and tenor of contemporary teens perfectly. And the design of the book — the illustrations, the footnotes, the arrangement of paragraphs on the page — is striking and vivid. Reading the book you know at once that the author is brilliant, the book special, and the pleasure of reading it, wonderful. Five-hundred years ago, sorcery began to fade from the world. As technology prevailed, combustion engines and computers replaced enchanted plows and spell books. Real magicians were hunted almost to extinction. Science became the primary system of belief, and the secrets of spell-casting were forgotten. That is ... until now. Sorcery for Beginners is no fantasy or fairy tale. Written by arcane arts preservationist and elite mage Euphemia Whitmore (along with her ordinary civilian aide Matt Harry), this book is a how-to manual for returning magic to an uninspired world. It's also the story of Owen Macready, a seemingly average 13-year-old who finds himself drawn into a centuries-long war when he uses sorcery to take on a school bully. Owen's spell casting attracts the attention of a ruthless millionaire and a secret society of anti-magic mercenaries, all of whom wish to use Sorcery for Beginners to alter the course of world history forever.